American riders won both the men's and women's races at the Global Relay Gastown Grand Prix in downtown Vancouver Wednesday night, in front of huge crowds. On the women's side, an American rider won the Global Relay Gastown Grand Prix for the second straight year after Kendall Ryan took the victory and the $12,000 payday. She sprinted ahead of Rally Cycling teammates Sara Bergen and Allison Beveridge in front of the biggest crowd for the women's finish since Global Relay rebooted the race in 2012. In total, 79 riders from 24 teams took to the start line, tying the record of most riders, which was set two years ago. "I was just telling my teammate Heather (Fischer) in front of me to be patient and wait, wait, wait until the last lap. No matter how many times we were being swarmed, we'll just keep moving up," described Ryan, who rides for Team TIBCO-Silicon Valley Bank and won the U.S. Pro Criterium National Championship in 2015. "On the last corner, I really had to ride defensively and make sure I could take my line. Then I just powered it out of that last corner, I just buried myself into a deep hole of suffering, it was a really awesome finish." Like many of the riders, the 24-year-old is making her first trip north to race at BC Superweek and after a win and a tough result, Ryan is impressed with the caliber of cycling during the series. "This is my first time up here racing, it started really well pulling off a win at the Delta road race. Yesterday (in New West), that course is super brutal and I totally blew sky high and couldn't even finish. Kudos to winner Kirsti Lay, that was a hard race," she summarized. "Today, I think the course suited my strengths, I'm really good at tactical, technical races, just sticking it out and being patient. I really like this course and can't wait to come back!" Bergen, a Vancouverite riding for Rally Cycling, came second just behind Ryan as the leaders almost caught the chase group on the final lap. "TIBCO rode a strong, aggressive race. Definitely not the exact result we wanted, we're out here to race aggressively, which every single women on my team did, so I'm super proud of that," said Bergen. "Too bad I couldn't bring home the big 'W' today, but I'm very happy to be up here on the podium with me and Allison." 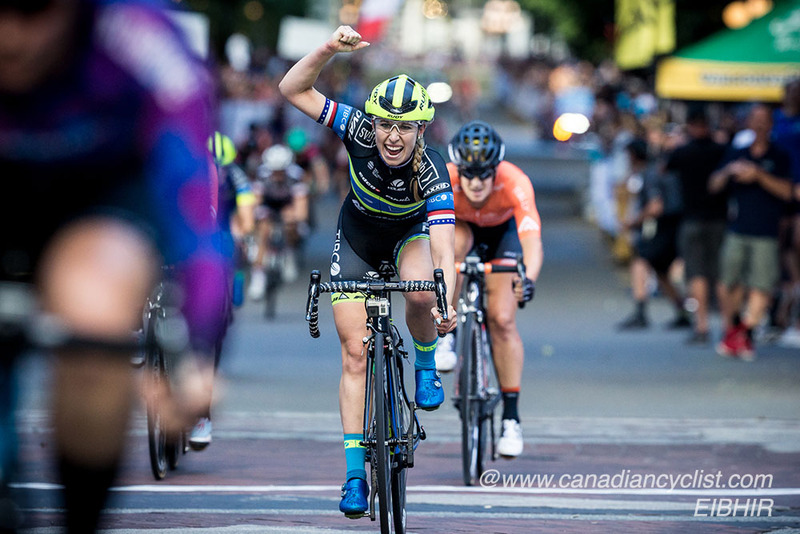 The 28-year-old finished fourth at last month's Canadian National Championship Road Race and was also second on Tuesday at the New West Grand Prix. The fact that it was the biggest crowd to watch the women's race in recent memory wasn't lost on Bergen - or any of the other riders. "A huge thanks to every single one of the fans out there who screamed their heads off, it means a huge amount to all of the athletes out here. Thanks to Global Relay for putting on this awesome race," she said. Beveridge went off the front ten laps into the 40-lap, 48 kilometre race and it looked like she might hold on to win, but was pulled back to the field en route to her third place finish. The 24-year-old from Calgary is coming off winning the women's Canadian road championship just a couple of weeks ago. She also won a bronze medal for Canada in team pursuit at the 2016 Rio Olympics and was second at Friday's MK Delta Lands Criterium as part of the Tour de Delta. Eric Young has cemented his place among a very select group of cyclists. The 28-year-old from Boulder, Colorado attacked on the final lap and won the Global Relay Gastown Grand Prix for the second straight year on Wednesday night in Vancouver's historic Gastown neighbourhood. The Rally Cycling sprinter joins Canadian riders Alex Stieda, Bill Wild, Brian Keast and Gord Fraser, along with American cyclists Jonas Carney and Ken Hanson, as the only two-time winners at Canada's most famous criterium race. Ron Hayman holds the record for most men's wins with three, which he accomplished in consecutive years from 1981-83. Young joins Hanson and Hayman as the only cyclists to win in back-to-back years in Gastown. | Citadel Cycling Team caught him with a quarter of the race left. With 11 laps remaining, the peloton came back together for the first time since early in the 50-lap, 60 kilometre race. 146 men started the race, with just over half crossing the finish line. "I've got to say that was one of the hardest lead outs I've ever been a part of. There was a little bit of a break up the road and at 12 to go we didn't want to take the front that early, but we had to bring it back together. That was a risk, we took it, my teammate Jesse Anthony rode amazing up there, it was he and Pierrick Naud," said Young, who is a two-time U.S. National Criterium Champion. "With a six-man team, it's hard to control the race, the guys rode out of their hearts today, and it's truly amazing!" When faced with the prospect of winning the top criterium prize in North America at $12,000 for a second straight year, Young was a bit beside himself. "I can't really believe it, Gastown is a hard race, but it's my favourite criterium of the whole year, and that's true for a lot of guys. You host such a great race up here, it's amazing. It's an absolute honour to win this race two times in a row, it's so historic." 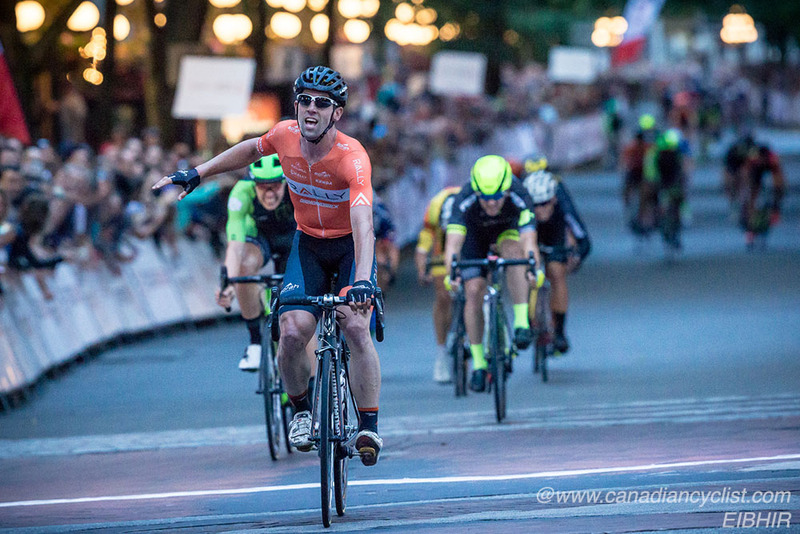 The win is also Young's second in five races this year at BC Superweek after he took top spot in Friday's MK Delta Lands Criterium to kick off the series and the Tour de Delta. Wednesday's second place finisher also made his second podium appearance at BC Superweek this year. Scott Law, an Aussie who's riding for the Cylance Cycling Team, came in just behind Young to claim $5,000 in prize money. The 26-year-old third generation cyclist was also second in Sunday's White Spot | Delta Road Race. Magner, a seven-year pro from Griffin, Georgia making his first trip to BC Superweek and the Global Relay Gastown Grand Prix, felt the course prevented he and his Holowesko|Citadel Cycling Team from sustaining any pressure in the lead peloton. "The last lap is kind of a blur, all the laps leading up to it were pretty hairy to be honest. My teammates John Murphy, Miguel Bryon and I were trying to stay together, but when we don't have a lead out going, it's a bit tough for all three of us to stay together. It was crazy down the back stretch and Eric had a great run there," he explained. As 2017 is his first visit to BC Superweek, the 26-year-old was impressed by everything he saw in Gastown. "The crowd is incredible, I can only think of a handful of other races around the world with a crowd like this. The course is unique, the hairpin turn is super tight, it's a really fun course," Magner said. BC Superweek continues on Thursday with the Giro di Burnaby presented by Appia Development. The women's race starts at 6 pm and the men begin at 7:15 pm. 5 Joelle Numainville (Can) Cylance Cycling Team all s.t. 8 Maggie Coles-Lyster (Can) TaG Cycling Race Team s.t. 27 Rachel Canning (Can) Fluevog's Crit Nasty all s.t. 29 Starla Teddergreen (USA) Hagens Berman | Supermint s.t. 45 Isabella Bertold (Can) TaG Cycling Race Team all s.t. 49 Anne Ouellet (Can) Fluevog's Crit Nasty s.t. 76 Mason Burtnik (Can) Independent all s.t.